Everybody needs a holiday. The Doctor needs one more than most. So where better to dip one’s toes into the deep twinkling blue than Brighton Beach? There’s always fun to be had at the end of the pier… unless the resident stage magician has been taken over by foul, evil forces, that is. 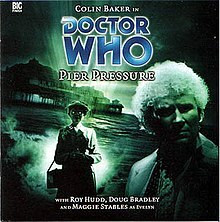 But you just have to laugh, really, especially if your guide for this evening’s promenade along the pier is none other than the cheeky chappy Max Miller himself…And so we conclude this “season” of Sixth Doctor audio adventures with another Robert Ross tale and another alien-inflected romp through history. And another star guest from the world of comedy too – this time, Roy Hudd as Max Miller (thus explaining the terrible pun of the title, for which I refuse to apologise). Not being a great fan of Max Miller (or even that conversant with his comedy), I was left rather cold by much of the goings-on in this play. There’s a lot of back-and-forth banter between Max and Evelyn, but it gets quite wearing after a while and I found myself wondering if the play could work with half an hour taken out. Not usually a good sign. The banter isn’t always successfully placed either, even if the denouement depends on Miller’s infamous capacity to hold an audience. Another problem is the character of Billy, who vanishes quite inexplicably at the end of the first episode. “I’m off home!” he shouts – and he’s gone just like that. The Doctor is on the scene, and there’s no need for Miller’s foil to stick around. The alien menace is rather more direct than in Ross’s last play, submerged beneath the pier and using long-dead Professor Talbot as a mouthpiece. Doug Bradley, playing Talbot, gets to exercise his chops as a possessed villain, but his human self is a little too wishy-washy for my liking. The problem from Medicinal Purposes – the Doctor’s random mood changes – also rears its head again: the Doctor alternately cares too much and then not at all about the death of young Emily. In all, like its predecessor in this run, not really a play that I can claim to have properly enjoyed. And that’s a shame, given the star quality of the guests involved, so let’s declare this “season” closed and get on with the next one, shall we?